InterContinental Houston Medical Center opened. HOUSTON – (Realty News Report) – The 21-story InterContinental Houston Medical Center has opened on Main Street, marking the return of the upscale InterContinental brand to Space City. Developed by Medistar Corp., a Houston firm led by Monzer Hourani, the 354-room luxury hotel is located next to the 1,345-acre Texas Medical Center, the world’s largest medical complex. “We are very pleased to work with Monzer Hourani and Medistar on this landmark project to host guests from all over the world,” said Elie Maalouf, Chief Executive Officer, Americas for IHG, the manager of the hotel, 6750 Main Street. 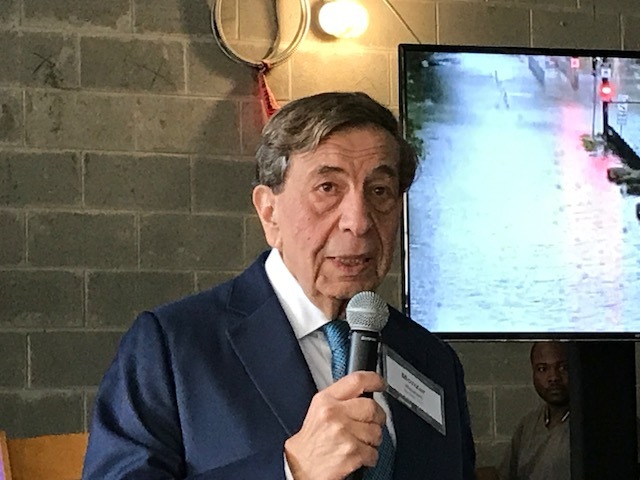 Maalouf attended the recent grand opening along with local elected officials and Dr. Khamis Rashid Al-Kaabi, consul general of Qatar; and Sultan bin Abdullah Al-Angari, consul general of Saudi Arabia; and Oscar Rodríguez Cabrera, consul general of Mexico. Room rates at the InterContinental will not be cheap. The IHG website offered rooms starting at $202 for a stay on Thursday night. 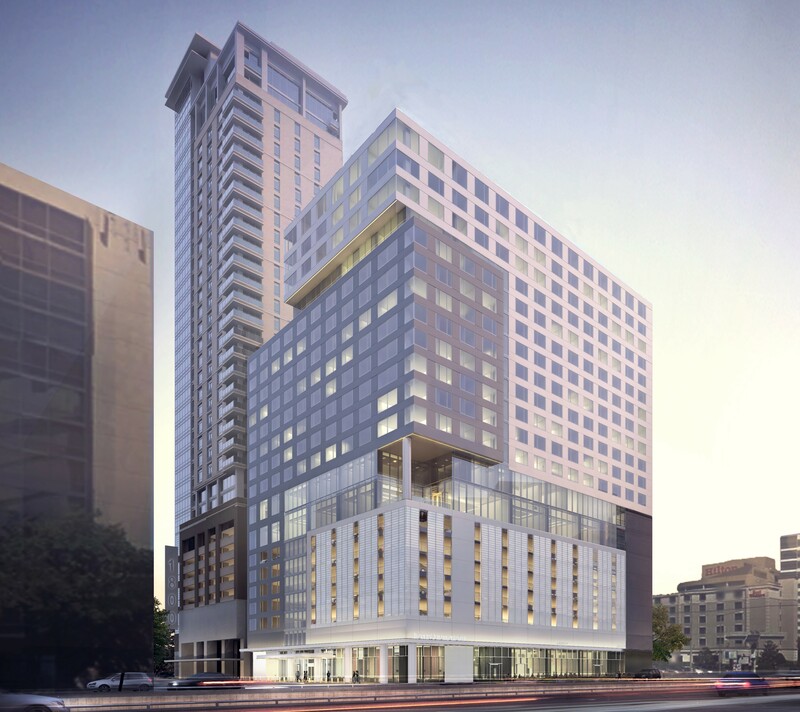 The new hotel is part of a dense urban development by Medistar that includes the InterContinental hotel, a multifamily tower and a medical office building that is under development. The site is just south of Rice University and north of Holcombe Boulevard. Medistar’s Monzer Hourani at 2017 event. Photo credit: Ralph Bivins, Realty News Report. Medistar developed the InterContinental in partnership with TRC Capital Partners and the 375-unit apartment tower, which features micro-units under 400 SF, was developed by a Greystar/Medistar partnership. The 35-story multifamily development, called Latitude Med Center, opened last year. The next phase is a medical office building, adjacent to the InterContinental. It is called Innovation Tower, a 48-story, 1.6 million SF mixed-use project. Innovation Tower will be located at 6700 Main Street, the site of the Sure Stay Plus by Best Western hotel, which is being demolished. Medistar is developing the Innovation Tower in two phases. Phase 1 offers 476,500 SF of medical and life science office space with 35,000-SF floorplates above a parking garage for 1,700 vehicles, with retail and a penthouse-level restaurant and lounge. Medistar will develop Phase 2 to respond to market demands, with the possibility to include 410 luxury high-rise residential units or additional medical, biomedical and life science office space.Transwestern is leasing the project. Although the Houston-based Medistar firm is primarily known for its medical-related developments, the company also has developed land and commercial projects, including the 150-acre ParkWest Business Park in Katy. Other recent Medistar projects include PAM Rehabilitation Hospitals in Corpus Christi and Round Rock; a 60,000-SF medical office building in Webster; and VibraLife post-acute care facilities in Katy and El Paso. Hourani’s body of work also includes a medical office building constructed in San Antonio in the mid-1980s and many Medistar projects since then.